There's still time to nominate your favourite North West building, public art work or open space in the Derry Journal and Foyle Civic Trust's 2008 Favourite Buildings Awards. "Readers will nominate and vote on their favourite new buildings, newly-restored buildings, new public space and new public art of 2008 in the North West. Remember the building must have been completed during the calendar year 2008." Buildings eligible for nomination will be within the readership area of the Derry Journal: Derry City Council area; Limavady Council area; Strabane Council area; Inishowen; and East Donegal including Letterkenny. 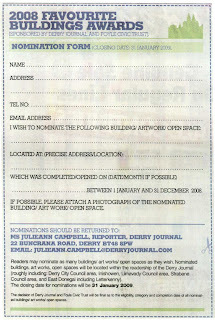 Closing date for nominations is 31 January 2009. The most popular three entries in all six categories will then be short-listed and published with photographs in the Derry Journal. Readers will then vote for their Favourite in each category; and for their overall favourite of 2008. More info on the Derry Journal website.